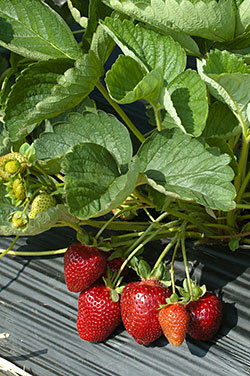 Look for Rutgers Scarlet™ strawberries in May and June. For fruit availability contact your local farm stand, pick-your-own farm and/or farmers market. See the Jersey Fresh site to find a listing of local farms. Check with the farm or nursery for availability, hours, and types of products. Product inventory can vary daily. Ag Field Day/Rutgers Day, last Saturday in April, gardeners will be able to purchase Rutgers Scarlet™ strawberry plants at the plant sale next to Bartlett Hall (84 Lipman Drive, New Brunswick, NJ) 9 a.m.-4 p.m.
Several Rutgers Master Gardener plant sales will also be selling Rutgers Scarlet™ strawberry plants. Check with your county’s Rutgers Master Gardeners for details. Nourse Farms sells dormant strawberry plants in March and April, both commercially and to home gardeners. Great Swamp Greenhouses sells potted strawberry plants in Morris County, NJ (Rutgers Scarlet™ bare roots were purchased from Nourse Farms). Moore’s Greenhouse sells strawberry plants for home gardeners in market packs and pots.